Should I talk about immigration? Zahra is a student abroad. 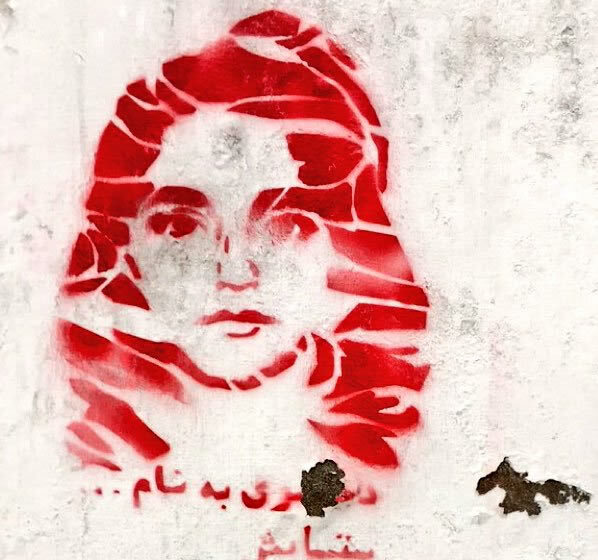 Satayesh stencil on wall in Kabul via Twitter. This is a heartbreaking poem — the violence and despair is overwhelming with so many victims — known and unknown. Thank you for giving voice to this pain so that we can all feel it more acutely and work for change. Nice poem but sad, I wish we could live in a society with out any Violence. “What is there to write that can make the world listen?” You are writing and that does matter! I hope you will keep on writing. Dear sister, from Texas, USA, I hear you. I love your writing. I hold your cry in my heart. I pray for peace to come to you swiftly and soon. Your poem gives awareness to the hidden hardships of Afghanistan and other middle eastern countries where equality is frowned upon. The pain is felt through your poetry and the helplessness of your cries are seen. The tears that are cried by the women of these oppressed countries are like rain on the ground. They are seen but nothing is done about it. Women are suffering and your poem brings awareness to the hardships they go through. Feeling helpless in a big world is hard especially knowing that other countries have so many privileges but I hope that does not stop you from always believing in hope and fate. At age 16, you have lived through the most devastating experiences. At age 16, you write as if no one is listening, but I promise I am. Your influence on the world is much greater than you think. Your poem is raw. You share the brutal reality. Your writing style dragged me in as I hung on to every word. I envy your courage and strength. I commend you for finding resilience for yourself. Thank you for inspiring me not only to be a better writer, but a better individual of world. My prayers go out to you, your family, and your friends. Your poem shows all of the injustices in Afghanistan, it shows all of the hardships. You and others your age in the Middle East have gone through so much at such a young age. This poem informs the world on what is happening. Please, continue to write, and show your courage against this violence and discrimination. More people will become aware of what life is really like there. I agree with you that you need to let out the inner pain that most people do not notice. The World will know of all of the hardships you have faced, and the toll it has taken. This story makes me feel very happy as of how thankful I am to live the life I am. Your poem made me realize all the struggles that people go through like women’s discrimination in Iran and the attacks in Afghanistan. The author is sick of all the troubles that she has to go through and wants a change in the world. This poem also makes me more aware and more sensitive to the news, and how the world should not only focus on the major events that happen and are covered on the news. It is tough to realize that people go through life-threatening services every day and the only thing the news covers are major attacks that happen due to terrorist activity. This heartbreaking poem shows me how thankful I should actually be with the life I have right now. At age 16, you have seen much of the world and you have gone through the worst experiences. Reading about the violence and the traumatic experiences that people go through is devastating. At this young of an age, you were able to express the raw reality that you brutally go through every day. Overall, your poem inspired me to be much more thankful in my life and to take advantage of every opportunity that I have. You and your community are in my prayers. I hear your cry, from California. I HEAR you, I am listening and your pain is my pain, even though we have experienced different lives. Continue to speak out against injustice! Continue to lift up your voice, not only to God, but to the public, who need to hear YOUR voice. You are a beautiful writer and you write well, it’s beautiful and heart breaking, your words. I believe in you and pray you continue using your gift to stand up for justice. May the dead rest in peace, and may you be at peace someday. Stand up for injustice, and my best of luck to you. So beautiful and such talent from such a young person. Keep writing, you’re great at it. This poem is powerful and far-reaching. With your words, you have the power to tell your story and change the world by changing people. It serves as a reminder that everyone’s story is worth telling. Thank you for sharing this poem. Dear Zahra, this is a beautiful and impactful poem. I admire your strength and courage for sharing your story. This poem is powerful. It takes great courage to write with such honesty. Thank you. I hear you. I hear your pain. I respect you and the strength it takes to write when there is so much pain around you. You are amazing, please keep writing so that others can hear you too. Zehra, keep writing. The world will hear you. Keep writing. This work is crucial. The pain of this situation is so eloquently expressed. You write about the violence wrecked upon women and name those women as well. You show that these women are important as individuals, not just nameless voices. This is a powerful feature in your work. Thank you for honoring those who were willing to sacrifice their bodies to stand up for the rights of others. This was an incredible poem. It communicated all the pain across screens and pixels as if it was being told face to face. This is full of emotions as well, as the pain, sorrow, regret, anger, and frustration can almost by physically felt. It was also very brave and very honorable of you to mention all their names, taking the time to give them some respect that they didn’t receive before they passed. Zahra, this is a beautiful and heartbreaking poem. Thank you for writing about something so dear to you and deciding to share with us. Thank you for your poem. Thank you for remembering those who sacrificed themselves to stand up against the oppression of women. You express this torment in a tone of eloquence that will force the world to listen. Please keep writing for women, for your country, and for yourself. While I was reading your poem, I could feel the devastation in your words and see your tears leaking through my computer screen. Your description of the atrocities committed by the Taliban and Afghani men upon innocent women simply standing up for themselves is horrifying and makes me rethink the privileges I possess. The killing of Farkhunda that you describe is just horrifying, and I can’t understand how the people who committed that atrocity could have such a completely callous character. Your description gives a new meaning to my life and how I should live it, as it describes a living situation which is much more chaotic, difficult, and harsh. I even feel ashamed that I can sit here and type this comment while hundreds and thousands of Afghani women are experiencing tumultuous times at this very moment. Towards the end of the poem, you ask a rhetorical question where you ask what you must do to make your voice heard. All I can say is that writing about our difficult experiences is a fantastic start to spreading your influence upon other well-off individuals. Before I read this poem, I didn’t know about any of the murders and physical violations that you described. However, after reading this, I can feel a sense of regret and sympathy towards you and your cause. Your heartbreaking poem describes the horrific things that many women, children, and girls face every day. My dad and aunt Maria growing up in Afghanistan tell me many stories like these and I’m sorry to hear that it continues just like It did some time back for them. You have an amazing gift for writing your poem strong and defiant allowed me to truly feel if I was there with you witnessing everything around you not only educated me, but all the others that I share it with and who read this. You’re a light for Afghanistan, a light for women, for girls, and for children, you have touched the hearts and told people the truth opposing those who seek it to be hidden. Thank you, thank you for sharing your experiences for remembering the people that stood up for women, the ones who were willing to sacrifice everything even their own lives to stand up for what is right. These people that stand up will make the difference, the world will realize someday and may Allah bring that day soon, however until them you fight and everyone who reads this fights with you I love Afghanistan its the. birth place of my father and I long to go back for it to be the loving, flourishing country it should be. As more more read more and more know bringing us and all of Afghanistan closer to change. Your poem was so beautiful, yet heartbreaking. The way you had used the name of women who were victims of gender inequality added so much power to everything you had to say. My heart goes out to all the women you knew and all the women you didn’t that had to face the wrath of the system. Though you are surrounded by those who may silence your voice, know that many women are rooting for you. Women all around the world spread your message and cry with you. Someday, people will realize how strong women truly are. Women will be up there running the world. Tabasum, Shokria, Rukhshana, and Satayesh will receive to justice they deserve. All living will hear your cry. Dear Zahra, your poem described the horrific realities many Afghan women face. The atrocities Afghan women have to face on a daily basis disgusts me. It just shows how blessed many people are and that we should all be grateful for every second of our life that we have. A combination of a lack of education and need for power have corrupted the Taliban’s mind into believing that women are inferior. I hope that you can be properly educated o you can be an advocate for change. The stories that you described us are just horrific. They portray the harsh realities of what life is like in Afghanistan simply because you are a women. Men believe you are just an object used to pleasure them. A women in society should be treated with the utmost respect since they are the creators of the new generation. As a Muslim man, I am ashamed to call those who mistreated you and other women men or Muslim. I hope that your writing can inspire Afghan women to take a stand for their God given rights. Your poem makes me realize how much violence is going on in the middle east. It makes me feel more grateful than ever to be lucky enough to live in a society that is well developed. I am truly sorry for the losses you have had and the suffering you have had to deal with living in a war ridden country. The extreme violence going on in Afghanistan should not go unnoticed. It is poems and stories such as yours that help shed light on the terrible events going on. I hope you continue to write these beautiful, heart spoken poems or stories. I wish you the best life has to offer you. I hear you and am grateful for your well written words to hear you from.Your sentences are powerful and informative. I am impressed by your voice and your memories that showed a side of your world, I could have never learned these unfortunate and horrifying events if you had not expressed your thoughts so I thank you. Your words helped me to appreciate my life and now led me to understand much harder lives than mine and I am sorry for your devastating times. Please keep writing and expressing your emotions and never give up to those who won’t let you. I hope with my greatest wishes that you and your people will find happiness and comfort, sometime. This poem is so well written, that I can feel every emotion that is being portrayed. I love that you are using real world problems and putting it into an elegant poetic form. It not only changes your perspective on how it’s read, but also the readers. I love the message behind it, and how every line is so powerful. Thank you for being courageous and expressing these ideas in a peaceful and caring way. People who bring hatred and negativity to the world, are missing out on the wonderful opportunity to be able to see the kindness in these words.